It has been a very busy season for our Field Service Team. We have added a number of new properties to our rental inventory. Many of these properties are single family homes. We don't just purchase them and rent them out. Before we put a FOR RENT sign in the yard, we want to be sure these properties meet our standards. Many of the properties we purchase have not had required periodic maintenance done and therefore have fallen into disrepair. Before we rent the property out, we make sure that all of the proper repairs and updates are done. This includes everything from electrical and plumbing updates to wall and flooring repairs to sometimes replacing windows and roofs. All the while, we also make sure that our existing inventory of properties don't suffer the same fate. The key to happy tenants is to be pro-active on building maintenance. We make every effort to address property maintenance needs before they become a tenant problem. It is important for us to re-invest back into our properties. 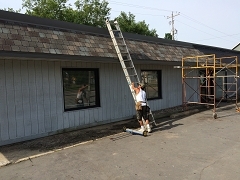 This year has been a very busy one for our roofing crews. We have replaced roofs on some of our duplexes, some of our single family homes, and have even done large apartment building roof projects. Some of our non-residential properties are also being updated. We are not done yet, as we have enough to keep our crews busy for the remainder of the season. Also, when investing into our properties, we do our best to keep that money local. Supplies are purchased from retailers located in the Wausau area, retailers that keep local people employed. Also, when hiring subcontractor labor, we look for businesses located right here in Central Wisconsin. Typically, our tenants do not need to ask us where their rent money goes. They simply can look out of their window and see that money being re-invested back into the property.